New Lenovo ThinkPad USB 3.0 Dock comes with irregular shape. Now laptop-toting mobile workers will be able to connect their computer peripherals while in the office or at a desk at ease. 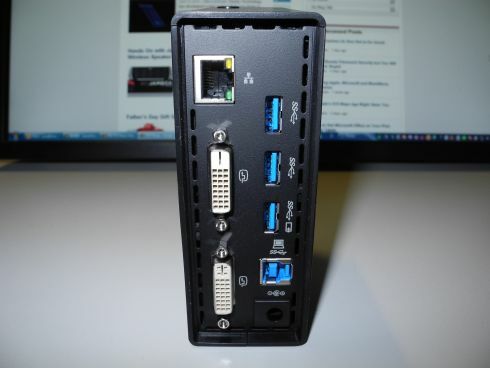 It has a USB 3.0 cable which connects the dock to the laptop along with five additional USB 3.0 ports, a gigabit Ethernet port and a stereo microphone port. It also claims that the ThinkPad USB 3.0 Dock has two external 2560 x 1600 high resolution displays with the latest DL-3900 graphics chip from DisplayLink. The laptop can be connected with a USB 3.0 cable to a DVI-to-VGA adaptor for use with VGA monitors and comes with a slim power plug. The display of the ThinkPad USB 3.0 was found out to be good. Apart from this feature, it also has a great design. The shape of the Dock is built in an irregular shape which does allow the machine to fall over. It also has a power button that can be switched off and a red LED confirms when it is switched on.